1940 Crocker Big Tank. Photographed through a window with a Nikon D200. 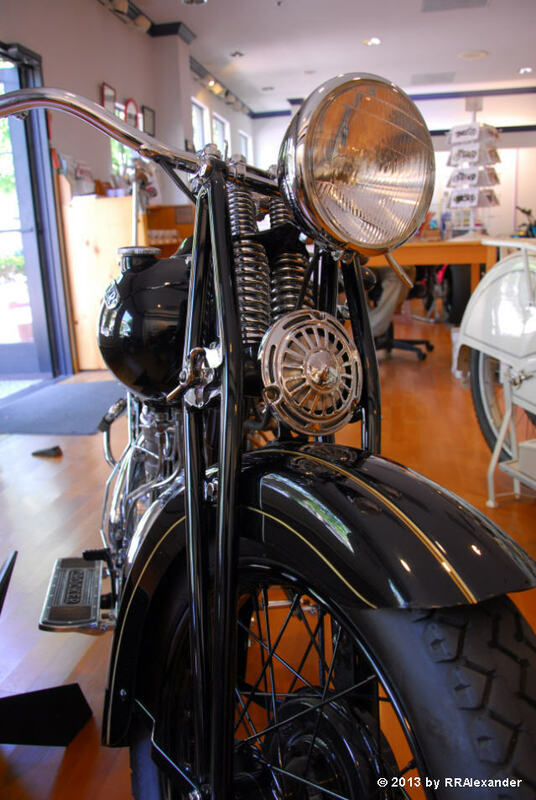 This 1940 Crocker Big Tank is in the Vintage Motorcycle Museum in Solvang, California. The museum houses the private collection of Virgil Elings. 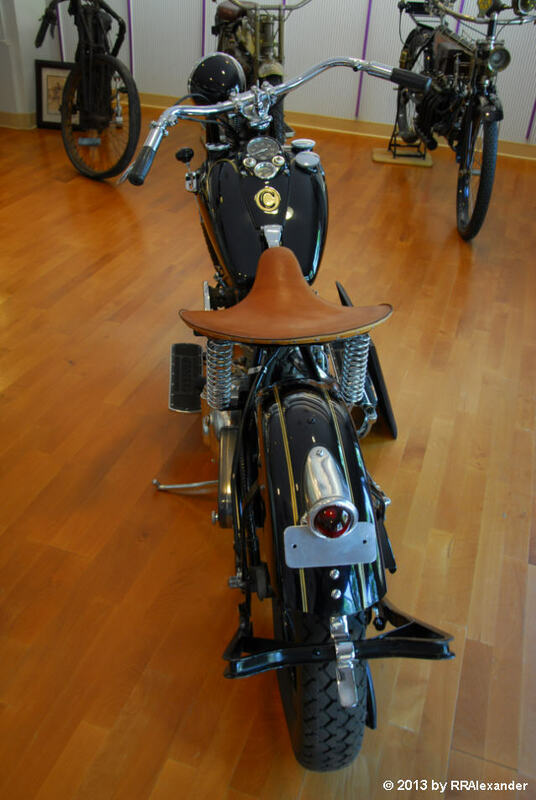 Motorcycles in the museum are constantly rotated in and out so the selection will remain fresh. Since Virgil and his son were involved in racing, the collection is racing-oriented. Born in 1882, Albert Crocker earned an engineering degree from the Armour Institute of Northwestern University and took a job with the maker of Thor Motorcycles, the Aurora Automatic Machine Co. Crocker developed Thor engineering and was a successful racer during the 1907-1909 seasons. As a result of his racing career, he met numerous motorcycling luminaries including Oscar Hedstrom and Charles Hendee, the makers of Indian Motocycles. Crocker developed a friendship with Hedstrom and Hendee and soon joined Indian Motocycles. In 1919 he opened an Indian dealership in Denver, Colorado. In 1924 he took over Kansas City Indian, then sold it in 1930 and bought the Indian dealership at 1346 Venice Boulevard in Los Angeles. 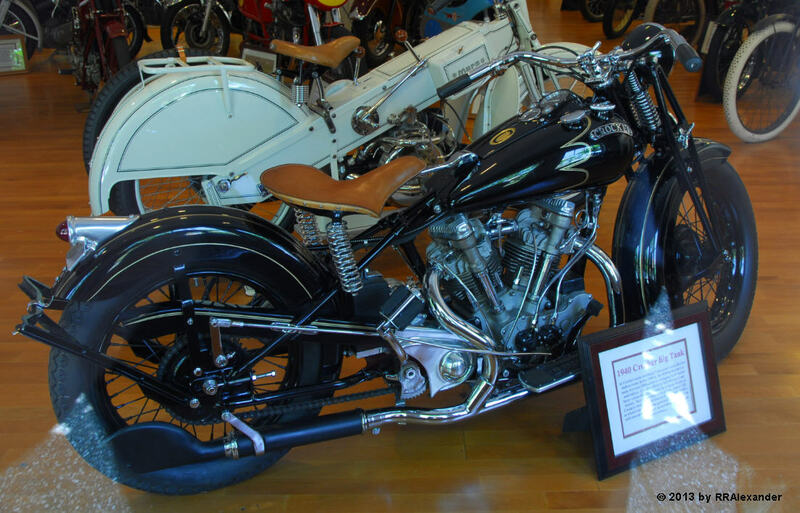 In 1931 he became interested in the developing sport of speedway racing and put his engineering skills to use by building a speedway frame to accept a 45″ Indian Scout engine. Crocker and Paul Bigsby (who later developed the Bigsby tremolo for guitars) then developed an OHV conversion kit for Indian speedway racers. The converted Indian engines in Crocker speedway frames had enormous successes at the track. 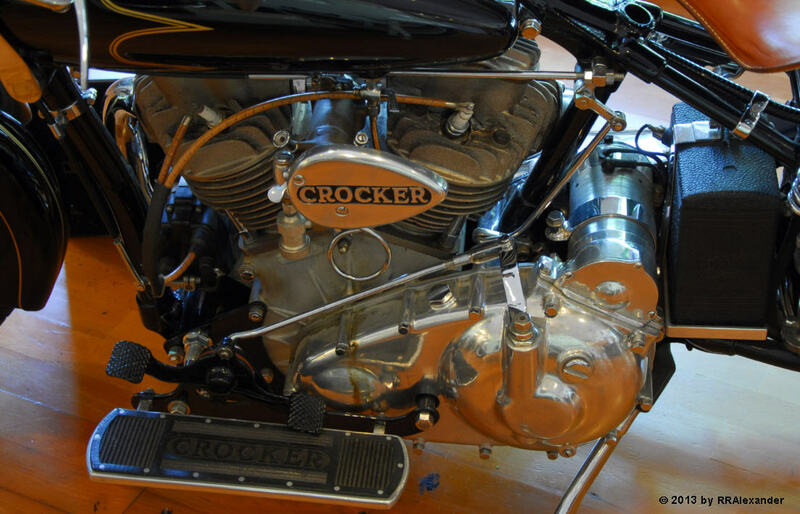 Because of limited production facilities, only 31 of the Crocker speedway models were apparently built, though rumor has it that some of the valve conversion kits were sold to members of the public. In 1935, Crocker turned his attention to a new project, the Crocker big twin. The big twin was designed to be nimble, durable, powerful and fast. 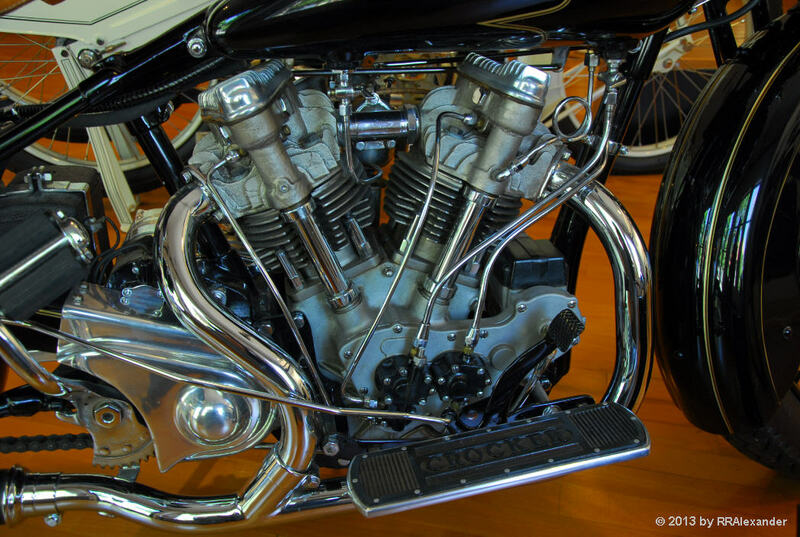 At a nearly “square” bore/stroke, the 45 degree v-twin engine had hemispherical OHV cylinder heads, and an extremely strong three-speed transmission. Bigsby made the patterns, the castings were sub-contracted, then machined in house. The first models used some Indian and HD parts; valve parts, timing gears and brake shoes. Other ancillary parts such as saddles, wheel rims, carburetors, and magnetos were obtained from standard industry suppliers. There was no “standard” Crocker, since the customer could specify the engine displacement and tuning. The (1,000cc) cylinder barrels were overbuilt and could be bored out to as much as 1,490cc. The typical 62″ models produced 55-60 horsepower, about 50% more than the Indian and HD sidevalve models. Crocker was so confident in the superiority of his v-twins that he offered a money-back guarantee: if any Crocker owner was beaten by a standard Indian or Harley, he would buy the machine back from the owner at the full price paid. No buyback ever happened. To give the v-twins more range, Crocker increased the size of the aluminum fuel tanks in 1938. The newer models were called “Big Tank”, and the earlier ones dubbed “Small Tank”. 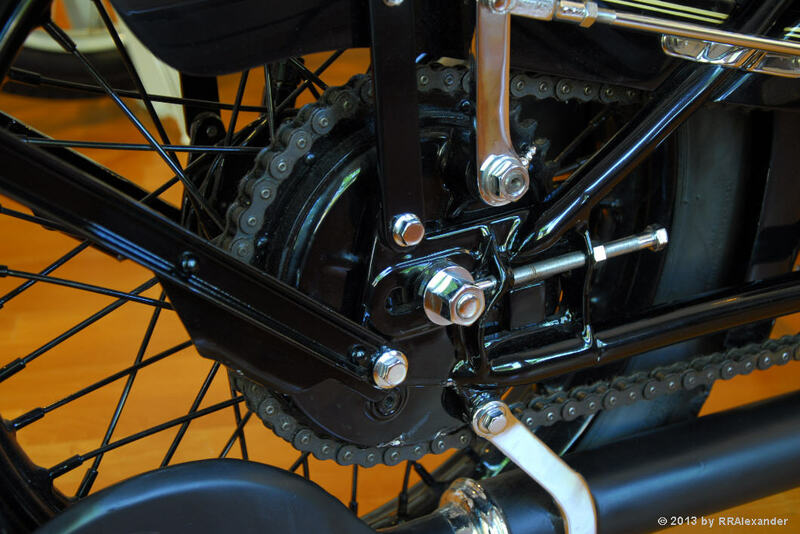 Crocker continuously developed his motorcycles, particularly the valve trains, until 1942, when the industrial demands of WWII made materials and ancillary parts difficult to obtain. As always, click on a photograph to view the larger version.